Rajavithi hospital signed a MOU on academic cooperation with Japanese National Hospital Organization Institutions Kure Medical Center and Chugoku Cancer Center as a Sister hospital Relationship on 24 February 2009 at Rajavithi Hospital by the then Director - General of Medical Services Department, Dr.Rewat Wisutwet represented Thailand and Dr.Wataru Kamiike, Chairman of Kure Medical Center represented the Japan and honorary witnessed by Dr.Prat Boonyawongviroj, Permanent Secretary of Ministry of Public Health. 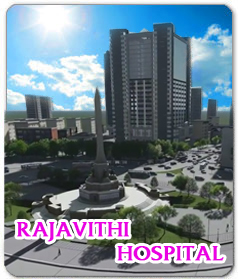 Meanwhile, in 2011 the Center of Excellence in Otolaryngology Head & Neck Surgery, Rajavithi Hospital signed a MOU on academic cooperation between Rajavithi Hospital, Medical Services Department and National Ear Nose Throat Hospital (NEH) of Vietnam. 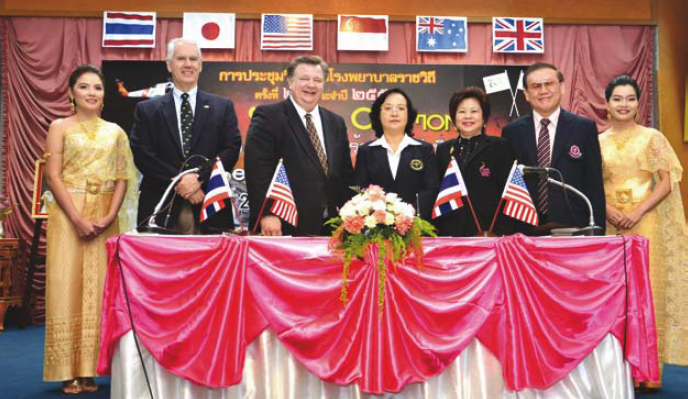 Also, a MOU was signed between Rajavithi Hospital and University of Texas Southwestern Medical Center at Dallas, USA in Emergency Medicine on 22 February 2012 at Rajavithi Hospital by Dr.Wilawan Juengprasert, Director-General of Medical Services Department represented Thailand and Associate Professor Raymond Swienton, MD and Mr.Thomas Lehman. Additionally, Rajavithi Hospital signed a MOU on ENT with Yonsei University Severance Eye & ENT Hospital ENT Seoul, Korea on 31 May 2012 by Dr.Wilawan Juengprasert, Director - General of Medical Services Department represented Thailand and Yong Won Park, M.D., Ph.D. General Director, Severance Hospital, Yonsei University College of Medicine.